I love working with photographer, Jenni Harper (Harper Young Photography). She has an eye for good lighting and balanced composition. Every few months we make plans to execute a photoshoot. This time we wanted to create beauty images incorporating moody lighting and textured, braided hairstyles. We decided to only use jewelry for wardrobe paired with shimmering make up. We are representing beauty and fashion with wearable looks for 2018. We chose to use costume jewelry for simplicity from JC Beauty in Louisville, KY. We selected three models, two looks a piece. Models were booked from Lexington, Ky and Cincinnati, Oh. We planned the shoot several weeks in advanced but challenges can happen. Our make up artist could not make the date last minute fortunately, I had an assistant on set. Caleb Yeske is both a hair and make up artist. He did and amazing job as he is well trained in his skill sets. Photoshoots have taught me a lot about how to just "go with the flow" as the show must go on. The end results speak for themselves as everyone did an amazing job. We created 2-3 looks per model and time ranged up two hours per look. Looks involved extensive braiding and the usage of hair pieces. Pre braided kanekalon hair and hair pieces were prepared a few days prior to the shoot. Make up looks included shimmers, bronzers and metallic hues. 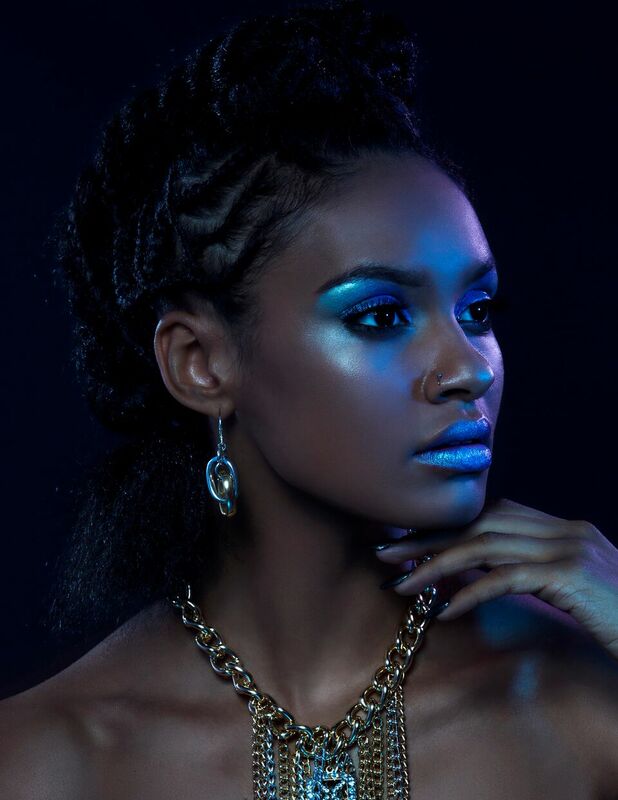 Highlighters, Metallic lip color and bronzed skinned were incorporated to match and reflect the moody set/lighting created by Jenni. Models nails were polished in metallic tones. For this look on Ayanna, I started with a directional blow-dry using Redken, Guts 10 upwards with a Sam Villa hairdryer and Denman Brush. Afterwards I converged the hair into pontails in the center like a "mohawk" while leaving smalls sections out that I cornrowed on scalp. I secured hair pieces on the small ponytails and attached the braids into them with hair pins and Fashion Works 12 hair spray. I used Water Wax 03 pomade and a fine tooth come to wave the fine hairs around her hairline on Ayanna's skin. This look on Kirjah, was created by sectioning small square sections into elastic bands and converging them together (cross hatching). I found Hardware Gel 16 helped with control of the hair. The top of her hair was braided with Kanekalon hair for length and density. For this look on Katy, I section the center top and secured the hair into several ponytails that I pulled and loosen. The remaining hair was braided scalp and formed into a rosette and secured with hair pins. Control Addict 28 was used to set the look. The collection was published in the January 2018 beauty issue of Beau Nu Magazine. We were excited and honored to have it featured. The above look on Katy, involved irregular sectioning for on scalp braids pinned into a textured updo. bts video making of of "Radiance"